I can't believe this is my final free project from Bead Chic! Where does the time go? This one is a little more complex and a little bit funky. You can refine it or make it funkier as you choose. I love the primitive look of annealed iron wire, you can buy it at hardware stores and some places online. It's a little rusty, so you need to clean it before you wear it! I enjoy bending and shaping wire and the nice thing about a very stiff wire like iron is that it maintains its shape without too much need for work hardening, yet it takes to being hammered beautifully. 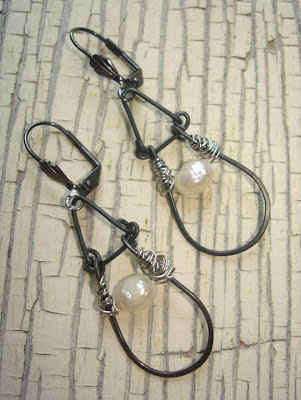 These earrings are made from three artfully bent wire segments that swing and sway separately from one another. 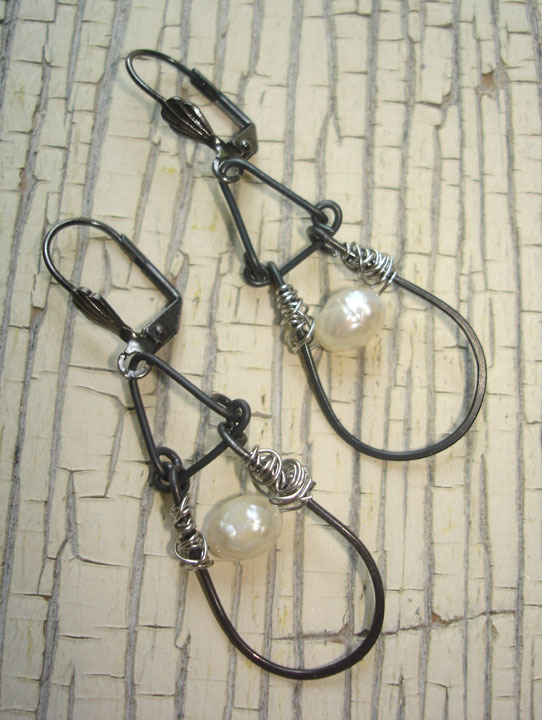 I added freshwater pearls suspended in some organic wire wrapping with a thin gauge of silver plated wire. These, to me, have a Sundance Catalog appeal. Banana Republic and Sundance Catalog have a latte at Starbucks. 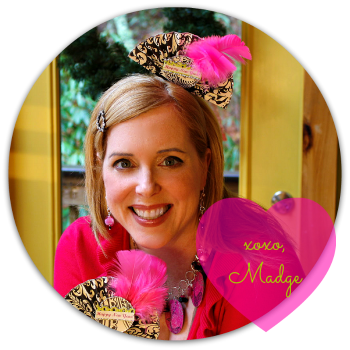 Chic, modern, upscale with just a little edge! The variation for this project is created by the lovely Ms. Barbe Saint-John. 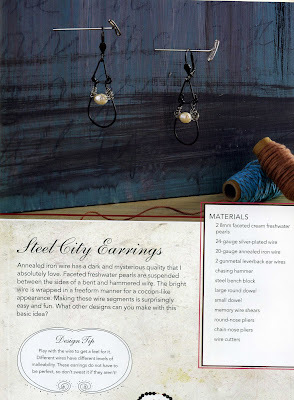 You'll have to buy the book to get the step by step photos and to see Barbe's gorgeous earrings. You can also leave a comment here to win the last free signed copy of the book! Tip: Play with the wire to get a feel for it, different wires have different levels of malleability. These do not have to be perfect...so don’t sweat it if they aren’t! 1. Cut a 3” segment of steel wire using your memory wire shears. 2. Bend the center around a large marker. 3. Hammer the ‘u’ section flat using the flat end of your chasing hammer. 4. Cut a 1 2/8” section of wire and use the tip of your round nose pliers to create a very small loop in both ends. 5. Cut a 1 ¼” section of wire and bend it over the metal end of a rat tail comb. 6. Use your round nose pliers to create a loop in both wire ends. 7. Wrap a 24 gauge wire tightly to one side of the top section of your ‘u’ shaped component as in photo moving the wire down the core. 8. Wrap wire around core in a free form manner. 9. Thread a pearl on end of wire. 10. Thread wire around opposite side tightly and wrap remaining wire moving up the core in a freeform manner as before. 11. Cut off excess wire and use chain nose pliers to tuck your wire tails in. 12. Connect your segments together as follows: Attach the ‘v’ shaped component to the loops on the end of your bar component. Attach the ‘u’ shaped component to the bar. The loops should all face backwards so the components can swing freely when worn. 13. Attach your ear wires to the top of each ‘v’ section. VERY NICE! Can anyone make these? I'd be too afraid to botch the job! Very Beautiful! I hope to win the free copy of your book! I'm getting some great ideas, the perfect earrings to enhance the polymer clay beads I've made! I love the combo of the steel wire with the pearl! I just love these projects that you are posting. Please enter me in the drawing. These are rad. The perfect name for them, so urban and chic! Again, thanks so much for the generous posts! pearls and steel..LOVE the contrast! Like pretzels and ice cream...they go together so great. Who knew? !